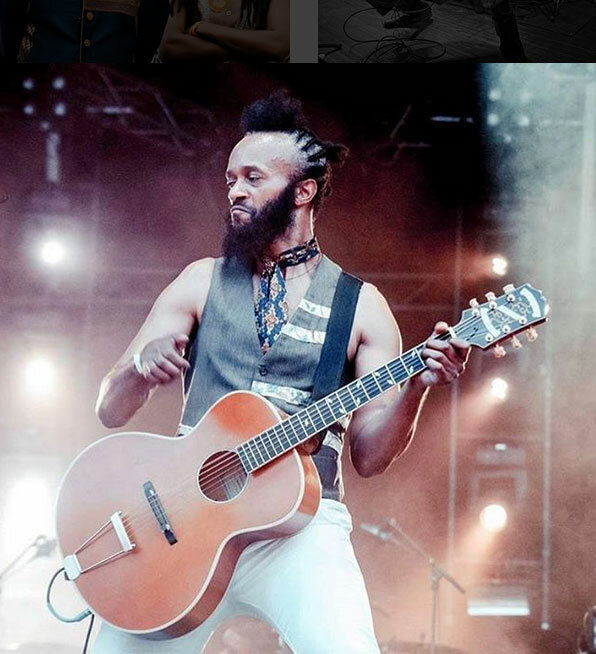 Fantastic Negrito is—as his bio eloquently states—the incarnation and brilliant invention of Xavier Amin Dphrepaulezz, born in 1968, the eighth child of a Somali-Caribbean immigrant and today on the brink of becoming a superstar. Dphrepaulezz grew up in Oakland, California and quickly took to a life of "bullshitting and hustling." Inspired by Prince, he took up music and songwriting as a teenager and became a most-likely-star when he signed to Interscope Records at the age of 25. What followed was a long series of disappoinments, clashes, rapid fame, and misfortune, and then periods of near death and finally, enlightenment. Dphrepaulezz especially credits becoming a father as the main inspiration to create his alter ego—The Fantastic Negrito—who could talk straight to his audience (and himself) with candor, love, and if necessary, admonishment to do more with one's time on Earth. As Negrito, Dphrepaulezz is now enjoying the third—and so far best—of what he refers to as "acts" in the play of life. 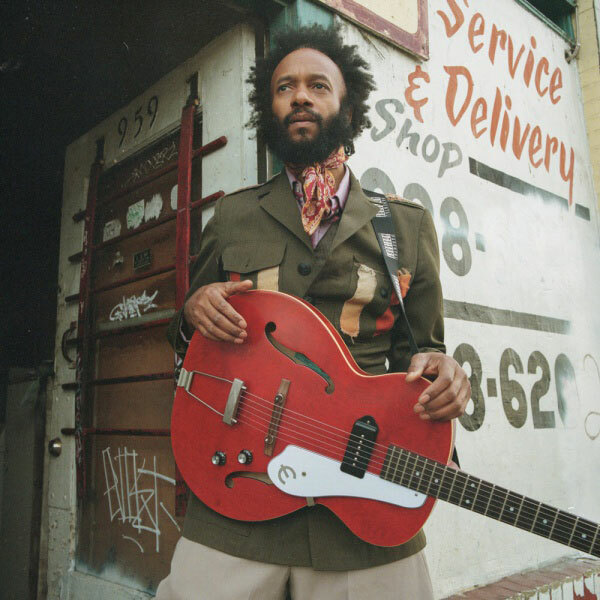 Most fans first became aware of Fantastic Negrito with his GRAMMY winning LP, The Last Days of Oakland (Best Contemporary Blues Album), a kaleidoscope rush hour of rock, blues, soul, and Hip Hop driven by his endlessly expressive voice backed by a parade of Epiphone Guitars ("They're tough and funky and ugly and beautiful, like me!") The success of his new album, Please Don't Be Dead, is keeping Negrito busy, performing at the world's major festivals and making fans of a wide, diverse, and sometimes argumentative (not to mention challenged) audience who seldom see Negrito's level of fearlessness in an era when most artists are looking over their shoulder when they're not staring at their phone seeking instant feedback. I met Negrito in the 'Gibson Room' of the Hutton Hotel in Nashville during the Americana Festival. The Gibson room is both a songwriter's lounge and a small recording studio ("We could just make a record right now"). Even at 11 in the morning, Negrito was resplendent in a long Egyptian blue coat with gold lace around the shoulders and cuffs, engraved buttons, and military style braids. The kind of coat a grand ship captain might have worn had he shopped on Carnaby Street in 1968. Negrito had just finished another interview ("Hey it's Americana, I'm glad to be here!") and was searching his phone for a local vegan restaurant ("I'm sure this manager will know... he's gotta be worth something!") Negrito is a warm and engaging artist on stage, an inspired performer who could easily manage the show with just pre-recorded rhythm and his voice alone. His current road band is lean (with bass lines handled by his keyboard player) and fits both his physical persona (tall and thin) and his personality. Negrito is quick to separate "Xavier" the man from "Negrito" the invention—even though both reside in the same physical space. Perhaps the soul of Xavier himself is in the middle, watching his stage invention and corporal self negotiate life and theater. So easy was our rapport and so fast did our conversation bloom that we managed the entire interview standing which later I felt sorry for, knowing Negrito uses a cane at times, a constant reminder of the horrific car accident that nearly took his life, crippled his right hand, but also made possible—he might say necessitated—his rebirth as a man and an artist. Negrito's devotion to realism and honestly extends to both his recording methods as well as his favorite Epiphones like the Inspired by "1966" Century and the Masterbilt® Century Zenith™. And congrats to Negrito who took home another GRAMMY for Best Contemporary Blues Album for Please Don't Be Dead in February 2019. You were saying before we started that compared to your first album you made in the 90s, you wanted to make The Last Days of Oakland in a very basic environment that kept the focus on the songs. Negrito is the performer but Xavier is in essence, chaperoning him throughout the world. Or in the song "Transgender Biscuits" (from Please Don't Be Dead), I'm putting in these lines —I got fired because I'm a woman. Ok, we're used to hearing that. I got fired because I'm a black man. Ok, we're used to hearing that. But then when I put the white man in there, you know... wait a minute! That's weird now (laughs). I think that white men have a point of view, too. And we better listen to that. If you're talking down to people, that's elitism at its worst. Everybody has value and everybody has some kind of contribution. And I like that. I get letters... When people follow me, I follow them back on Twitter. I got this whole "Make America Great" contingent (laughs) and I'm like: take a deep breath, if I talk all that s@#%, I gotta live up to it. I gotta talk to them. It's ok. We're not enemies. I feel like there's someone with a boot on our necks that's making us want to rip each other apart. There's an element to your songs that reminds me of old American work songs. The beat is modern—loops, samples, bass lines—but the songs could still stand if they were acapella. Is that fair? I think my other life was in three parts. First I was this young, good looking kid. 'Hey' everything's great, let's go get stoned. I want it all. I wanted to show everybody. I wanted the big car, the best of everything'. Then I ran into Prince's manager and he said, "You're gonna be #1." But I wasn't aware of what was going on. You get signed, you meet some people... they give you a million dollars. That's normal. Then you make a record and you're famous. I thought that's what it was. I didn't think: 'Oh no! There's a whole business here!' Then everybody hates you because they don't know what to do with the record. And Jimmy Iovine signed me personally and everyone's necks are on the line. I literally became depressed and I didn't know what depression was. I thought this is unreal. Life can go (snaps his fingers) like this? I came in as this wild untamed animal and what they should have done is put me with a good team of people to work with to kind of cultivate the guy inside. But life became hard after that because I thought I had failed. So, I think I wandered in the wilderness for something like twenty years and I wasn't sure for a long time. And then I had the accident, lost (the use of) my hand. Then I thought—here is some more insecurity. I thought I had a lot but—hey—how about some more (laughs)? So I thought I'll hide. So there was this scene called AfroPunk. I could die my hair and get wild. There was some good stuff in there but I think I was still trying. Then I did Chocolate Butterfly (2012). I just became frustrated and I quit. That was the end of Phase II. So I became a marijuana farmer. And then I started learning. The plants taught me. The plants were like people to me. I thought here's this plant—there's a lot of money invested in this operation. If I give this plant love and light and nutrients, it will produce for me and my family and my village. I thought if I neglect this plant and I don't check the ph, if I don't give it the proper light and care, then nothing will happen. That's when I thought (snaps his fingers); they are just like people. We are very fragile. This is the path that I want to live my life on that gave me great empathy. I became a little less judgmental than my Dad was. At that point, I did become the Fantastic Negrito. I thought: 'This guy, wants to talk to you. You getting off work? I gotta song for you! I think this song can help us. If you hate it, you're gonna tell me. I want to be that person. I want to be a contributor. And it's gonna be easy. The lyrics are harder but the songwriting process is so easy and natural. I don't feel like Fantastic Negrito all the time. That's dangerous. It's a fine line balancing all of this. I like where it is now, it's like I'm in some weird bubble. It's therapeutic. You created this world—this environment. How do you produce Negrito. What kind of producer were you in your youth as opposed to now? I think I was still always gong for something, trying to reach someone. You know what I mean? I just know who the artist is. What I'm trying to get out of this artist is why I started becoming Fantastic Negrito. I thought about my childhood being in rural southern Virginia with my grandmother's brother. His name was Horace Brown. This was the late 80s. He had this way. He had one arm. He would drink Johnny Walker Red and grape juice. And he was so senile he would call me 'Amos.' That was his name for me. I was his talking buddy. And the music he played —what he called country music—which confused me—was seeping in. Just guitar and singing. I directly went to Skip James and of course Robert Johnson. I heard these guys but I didn't understand them. I was a child of hip hop and that generation. Then I think for the first time I realized Johnny Cash was cool. I got obsessed with it. And I wanted to make records that could feel like that. I knew I couldn't do that but I wanted my music to feel like it was on the front porch. I wanted it to feel like I'm sitting with Horace Brown. It has to be that feeling that we're all just sitting around clapping hands. It brought me back to wanting to be a musician again. It was amazing to me that Skip James was communicating with the world with that guitar. So was Leadbelly. There's nothing more punk rock than that. As a producer, I am from that Hip Hop generation. Give me those beats! Give me that loop! Now play it over and over! (Laughs). That's in my DNA, too. It's all a mixture. I don't know if I love producing. My approach might be so weird that I just couldn't find someone to do it. It's my dream to one day not have to produce. But that's just where I am. I'm on this weird island. What is your audience like today? I have the weirdest audience ever...14 year old kids with their parents. Then it will be some edgy 30-year old. And then there will be someone in their 80s saying: "You keep playing, it's keeping me alive." I'll have someone tell me, "Hey, my grandkids turned me on to you." But it kind of makes sense. I'm not a genius. I'm pulling from this amazing garden, this amazing history that was planted a long, long time ago. Everybody got a hold of it. Rural white people got a hold of it, the English, the Irish, James Brown. So I'm just picking from this amazing, beautiful garden. I don't really know who my audience is, they're all over the map. Which could be a nightmare for the marketing people but that's their problem! I don't care. Let it be what it is. I think it's cool. I'm an optimist. Despite how edgy people think I am, I'm an eternal optimist and that's why I'm here and that's why I still attempt to play instruments with this hand that doesn't move and I'm walking on a cane. This is life that's happening and it's really beautiful. You play a number of Epiphones on stage. 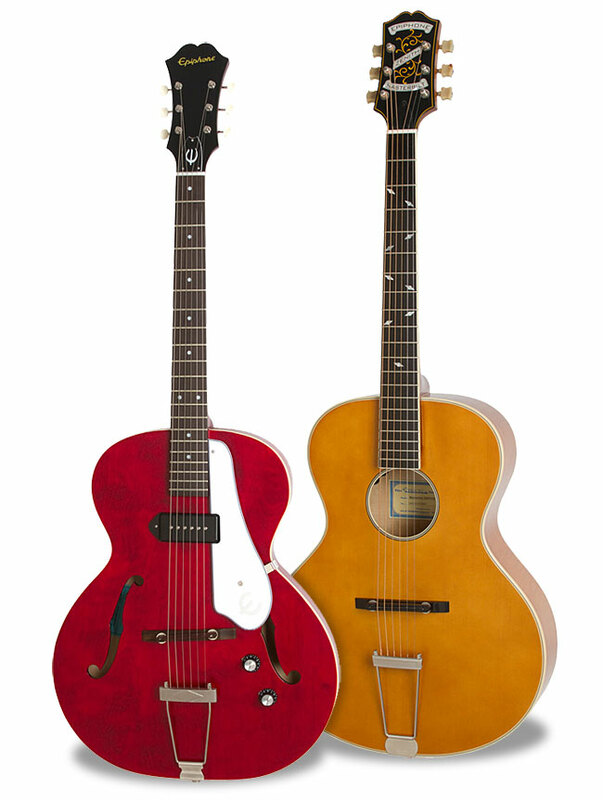 How did you Epiphone come to be your favorite guitar? I don't know anything about guitars. I had been playing piano and percussion and stuff. Then when I was becoming Negrito, a guy was moving out my creative arts space and he had a guitar. I wanted to go out in the street and play some songs. I only knew a few chords. I said, could I buy that guitar? He said—be my guest. You can have it for $60. 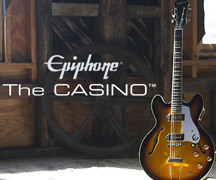 It felt like a common man's guitar and that's what I wanted and that's why I love Epiphone. It sounds like those guitars Robert Johnson was playing. Time went on and different people were offering me guitars. Gibson offered me guitars. 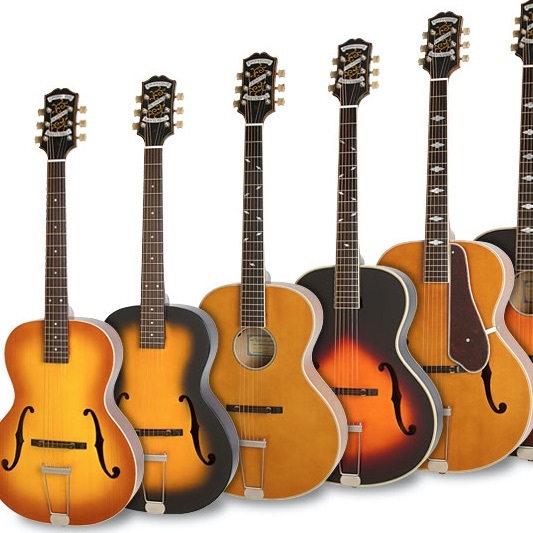 And I thought, well Gibson is nice but the Epiphone sounded more accessible. It sounded uglier (laughs). That's my sound. My hand is like the claw. The sound reminded me of me! The guitar, like me is shouting (waves his fists in the air): "I will not die!" It's old and beautiful and ugly and dirty. It's just so sweet baby!